The winter months and their associated festivities bring with them a desire to cozy up indoors with woolen jumpers and log fires, while our palates turn from light and fresh summer fare to rich and aromatic flavors. 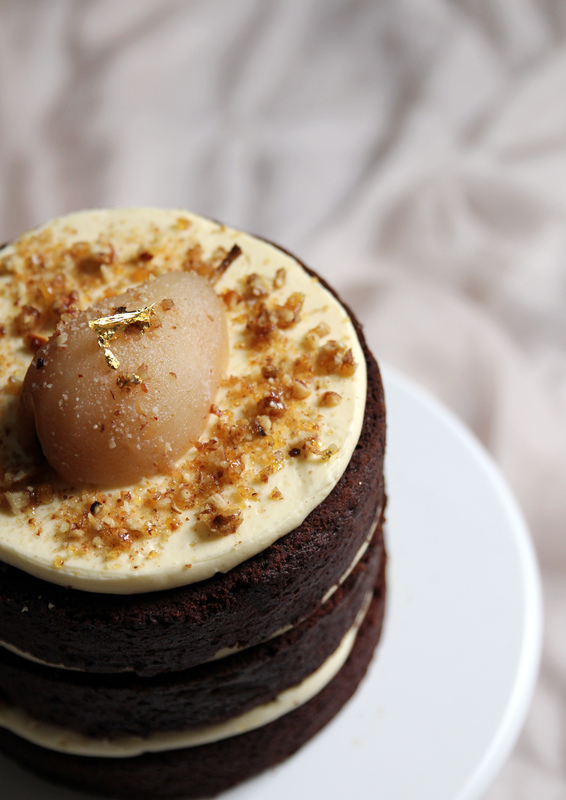 This recipe for Chocolate Ginger Cake with Chai Buttercream, Chai Poached Pear, and Candied Pecans is inspired by those warm and spicy scents and the flavors of winter. 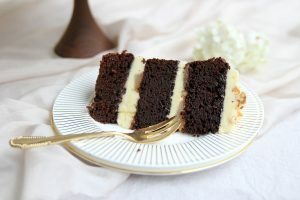 This Chocolate Ginger Cake is deliciously light and moist, with the ginger adding just the right amount of heat to give a little winter kick, without being overbearing for those who are not so inclined toward ginger. Chai is a spiced milk tea from India, the spices used in the beverage vary from region to region but generally include the heady mix of cinnamon, ginger, cloves, cardamom, and pepper; a perfect spicy complement to the ginger of the chocolate cake. I have introduced the chai flavor through a Chai Buttercream, and also in the Chai Poached Pears. 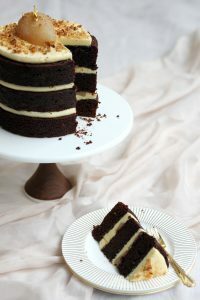 Chocolate and pear is a match made in heaven and the pears are a beautifully sweet and fresh addition to this cake. The final flourish is the candied pecans, adding a little crunch and extra seasonal decadence! Decorated with half a poached pear, candied pecans, and a little gold leaf, this cake is a little bit special and would make a delectable centerpiece dessert for seasonal gatherings. Much can be made in advance in preparation for entertaining: un-iced the cake keeps well in an airtight container for up to a week while the buttercream can likewise be made in advance and stored in the fridge. Once assembled it will keep well for 2–3 days in the fridge…if any lasts that long! 1) Preheat the oven to 160° Celsius/320° Fahrenheit. 2) Grease and line three 6-inch cake tins. 3) Melt the butter and chocolate in a saucepan over low heat. 4) Remove from the heat and whisk in the sugar and cocoa powder until incorporated. 5) Slowly add the hot coffee and whisk until smooth. 6) Whisk in the treacle and then the eggs one at a time. 7) In the bowl of a stand mixer fitted with a whisk attachment (or a large bowl), sift together the flour, ginger, baking powder, baking soda, and salt and mix gently until combined. 8) With mixer on low speed, gradually pour the chocolate mixture into the flour mixture. Once added, beat on medium-high speed for approximately one minute. 9) Scrape the bottom of bowl and beat again briefly until there are no lumps and everything is well mixed. 10) Divide the mixture between the three tins and bake for 25–30 minutes or until springy to the touch and a skewer inserted into the center comes out clean. 11) Leave cakes to cool in the tin for 10 minutes before turning out onto a wire rack to cool completely. 1) Melt the butter in a saucepan over a medium heat. Heat until the butter begins to sizzle, turns to a light amber color, and exudes a delicious toffee-like aroma. 2) Remove from heat and add the chai tea bags. Leave to infuse for at least 30 minutes. 3) Remove the tea bags and pour the butter into a bowl. Place in the fridge until firm (ideally overnight). 4) When ready to make the buttercream, remove the flavored butter from the fridge and allow to warm up slightly (you want the butter cool but not cold). 5) Clean the bowl and the whisk of an electric mixer with a squeeze of lemon juice and dry with paper towel to remove any traces of grease. Place the egg white and sugar into the bowl and place over a pot of simmering water, whisking constantly, until the temperature reaches 160° F on a candy thermometer. If you don’t have a thermometer, whisk until the sugar has completely dissolved and the egg whites are hot to the touch. 6) Transfer the bowl to the stand mixer and, using the whisk attachment, whisk until the meringue is thick and glossy and the bottom of the bowl feels barely warm to the touch. 7) Switch to the paddle attachment and, with mixer on low speed, add the butter a cube at a time, mixing until incorporated after each addition. If the mixture curdles continue to mix until it comes back together. 8) Add the cinnamon and ginger and mix again briefly. If the buttercream is too runny, refrigerate until firmer and whip again before using. 1) Place the water in a saucepan with a squeeze of lemon juice and bring to a boil. Remove from heat and add chai tea bags. Leave to infuse for at least 30 minutes before removing the teabags. 2) Add the sugar and bring to a simmer again to dissolve. Peel the pears and add to the poaching liquid. Simmer for approximately 25–30 minutes until the pears are tender. 3) Remove the pears from the poaching liquid and set aside to cool. 1) Heat the sugar in a small saucepan over a medium heat, swirling from time to time until caramelized. 2) Remove from heat, add the chopped toasted pecans, and stir to coat. 3) Pour the praline out onto some non-stick baking paper. When cool break up into small pieces using a rolling pin or pestle and mortar. 1) Level the tops of each of the three cakes so they are identical in height. 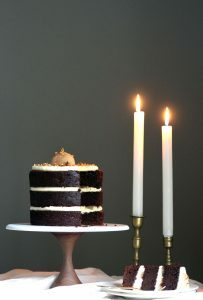 2) Place one cake layer on a cake plate or stand. Pipe one-third of the Chai Buttercream on top and smooth over. Chop one and a half of the poached pears into small pieces and sprinkle half on top of the buttercream. Sprinkle over a third of the praline. Repeat with the second cake layer. 3) Place the final cake layer on top. Pipe and spread the remaining buttercream and sprinkle with the remaining pecans. Place the remaining half a poached pear on top. If desired add a little gold leaf. Suzanne Brady is owner of Cove Cake Design. A former scientist, with a Ph.D. in biochemistry, Suzanne discovered a natural love of baking after becoming a full-time mother in 2008. With a passion for flavors and ingredients, and exuding a real flair for contemporary cake design, she was eager to turn her talent into a viable home business. Suzanne has a Professional Masters Certificate in Cake Decorating, Royal Icing and Sugar Flower Techniques from Squires International School and a PME Knightsbridge Diploma in Sugar Flowers. She creates custom cake designs. Cove Cake Design has flourished into a thriving home business whose cakes have been recognized and featured in numerous wedding magazines and blogs from around the world.